PRIME MINISTER Narendra Modi on Saturday stressed upon acknowledging “ease of filming” apart from “ease of doing business” for branding Indian cinema aggressively. He announced that his government was working on the formulation of a “single window system” for shooting of Indian movies. “A special (web) portal is being developed to facilitate this reform,” he said. 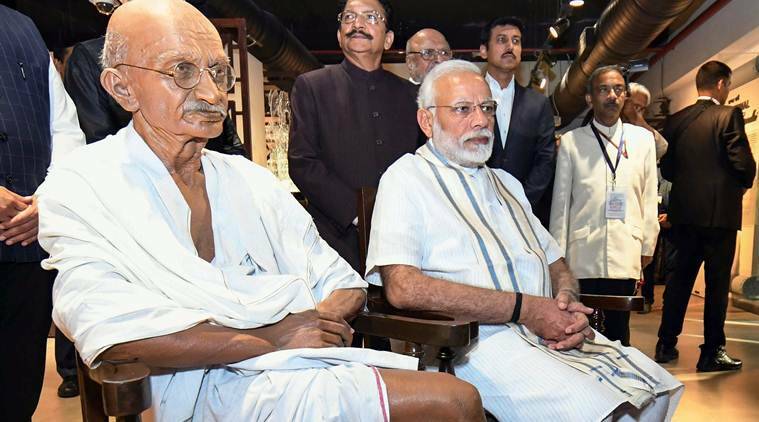 Modi was addressing members of the Indian film fraternity at the inauguration of the National Museum of Indian Cinema (NMIC) on Peddar Road in Mumbai. Contending that the film industry has always played an important role in branding India and furthering the thought of a new India, the Prime Minister also announced his government’s plan to modify the Indian Cinematography Act, 1952 to tighten provisions meant for penalising piracy. “The government is taking urgent steps in this regard. I promise you that camcording will not only be a punishable offence but it shall attract strict punishment,” said Modi. Reaching out to the film fraternity, Modi urged them to prepare a detailed note on film and shooting related laws that are obsolete. “My government has scrapped 1,400 obsolete laws in the last four-and-a-half years. Some of you should take the initiative and draft a note on laws (related to the film world) which are no longer relevant. My efforts would be to scrap these as well,” Modi said. He also said that the industry should think on the lines of organising a global film summit matching the stature of the World Economic Forum held at Davos in Switzerland every two years. He further stressed on the need to develop a “full-fledged university” on communication and entertainment. During his address, Modi took a veiled dig at the previous UPA regime over the delays in the inauguration of the NMIC. “For the last two decades, we have heard repeated discussions and debates over the film museum. Today, with its inauguration, the dream has finally been completed. My predecessors have left quite a few good things for me to unveil. I keep getting a chance,” he said. “It is a bit like the films. Earlier, our films would take eight to 10 years. Now, they are being completed within a few months. Wasn’t the same (delay) happening in the case of government’s policies earlier? Now, we are taking steps to ensure that the government’s schemes are implemented within a fixed time frame,” he added. The NMIC, a first-of-its-kind initiative to preserve the country’s film heritage, is housed in two buildings — the New Museum Building and the 19th century palace Gulshan Mahal — in the Films Division campus in Mumbai. The museum, set up at the cost of Rs 140.61 crore, is meant to offer visitors a glimpse into the evolution of Indian cinema with the help of visuals, graphics, artefacts, interactive exhibits and multimedia expositions. “Gulshan Mahal is a reflection of our cinema’s past glory. I’m told it even has a 30-hour footage on the bravado of Army’s soldiers who were martyred during World War I and II. The new building, meanwhile, is a showcase of our progressiveness,” said the PM. Highlighting the global impact of Bollywood, Modi recounted how during his July 2017 visit to Israel, he was pleasantly surprised when Israel President Benjamin Netanyahu, whom he referred to as a friend, recited the famous song Ichak Dana Bichak Dana from Raj Kapoor’s Awaara when the two of them met over dinner at Netanyahu’s house. “He did not know what it meant. But he recited the whole song,” said Modi. He added that during his visit to South Korea later, schoolchildren performed on the song Haathi Mere Saathi. “The film industry has played a stellar role in India’s emergence as a soft power,” he added. The NMIC contains scenes from landmark films like Dadasaheb Phalke’s Raja Harishchandra, Kaliya Mardan; replicas of old cameras and long-missing shooting equipment and rare photographs. Posters are on display to map the journey of Indian cinema over the last century. Gulshan Mahal’s verandah allows a walk through multiple eras of Hindi and regional cinema with the showcasing of posters, booklets, lobby cards and other exhibits. Gulshan Mahal is an ASI Grade-II Heritage Structure, which has been restored as part of the NMIC project. The displays in the Victorian-style building showcase the journey of over a hundred years of Indian cinema. It’s divided into nine sections — Origin of Cinema, Cinema comes to India, Indian Silent Film, Advent of Sound, The Studio Era, The impact of World War II, Creative Resonance, New Wave and Beyond and Regional Cinema. The new building houses four exhibition halls. One of them is dedicated to ‘Gandhi and Cinema’. Another one, the ‘Children’s Film Studio’, gives visitors an opportunity to explore the science, technology and art behind filmmaking. The creative use of technology by filmmakers over the years to produce cinematographic impact on the silver screen is showcased in the third hall. There is a special exhibition hall for ‘Cinema across India’ that captures the richness of the country’s cinematic culture.